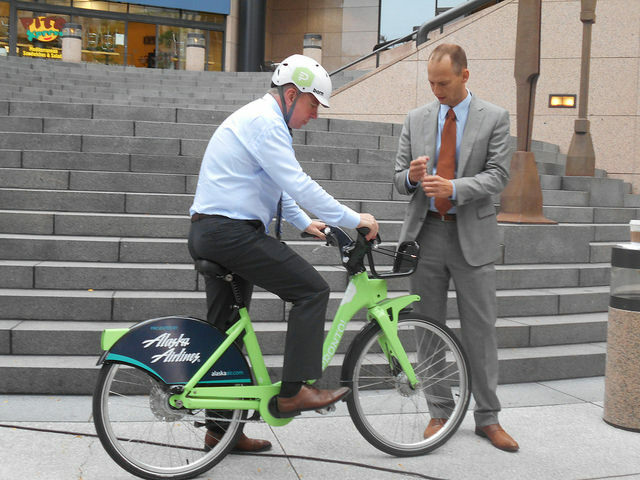 In a surprise Friday the 13th announcement, Mayor Murray quashed any attempt to revive public bikeshare in Seattle after Pronto’s March 31 demise. Whereas the Council had given the struggling system a 1-year lifeline, the city will now not follow through with an immediate replacement. Though city staff were optimistic about a potential replacement as recently as October, the potential contract with Bewegen for an electric bike share system is dead for now. Mayor Murray has achieved this election-year shut down by diverting the intended $5m funding stream to other bicycle projects. Much-needed Center City bike connections will now be prioritized instead, including 4th Avenue from Spring to Vine and east-west connections on Pike and Pine; and $3m will go towards Vision Zero goals via Safe Routes to School. Diverting the funding to other bike priorities is likely intended to soften or blunt the criticism from the bike community, and supportive statements from Cascade Bicycle Club and Seattle Neighborhood Greenways were in Mayor Murray’s press release (see below). But beyond politics, it’s true that a fully-built Center City network will definitely increase the chances of eventual bikeshare success. So while there may be future chapters for bike share in Seattle, the Pronto saga will come to a close on March 31 with a series of unforced errors and unnecessary political pain. Severely undercapitalized, hobbled by helmets, and going against best practices for network design, Pronto was doomed to disappointment at least and failure at most. For those of us broadly supportive of public biking in Seattle, the slow-moving demise was sad to watch. For now, a second try will have to wait. Mayor Murray’s press release after the jump. Today, Mayor Ed Murray announced over $3 million in funding for Safe Routes to School, as well as other bicycle and pedestrian improvements throughout the city. These projects will grow Seattle’s bicycle and pedestrian network as we continue to lay the foundation for a multimodal transportation system that reflects our growth and our values. The funding for these new projects is derived from funding previously allocated to the 2017 re-launch of the city’s bike share program. It will instead be invested in safety improvement projects and expanding the city’s bicycle and pedestrian network. Pronto, the city’s current bike share service, will end March 31. Adding pedestrian safety improvements, including traffic calming and crosswalk improvements, at 19 schools through the Safe Routes to School Program. Completing a missing link of the 4th Avenue bicycle lane and extension to Vine Street. Accelerating design and outreach for the east/west connections in the Center City bicycle network. Improving accessibility in Pioneer Square by adding curb ramps at key locations. These projects are scheduled to begin in 2017. When did Bewegen get the axe? Seattle… Where good urban transportation ideas go to die… bike share, streetcar, woonerf, pedestrian plazas, etc. Seems urban ideas that work elsewhere fail in Seattle. Add multi-billion dollar investments in rail to the list. I know, I know, it isn’t a total failure (wow, half the ridership of SkyTrain’s weakest line, at twice the distance) but for the money and the area covered, it is a failure. In all the cases it is the same thing: complete disrespect and ignorance of what works and doesn’t work elsewhere. The provincial attitude — we are a special snowflake! — is ridiculous. Station density might matter in every other city — but not here! People will flock to bike share or our subway line just because. Don’t bother to make your streetcar bigger than a bus (the only reason to bother) because everyone will just love it — this is Seattle. BART can be excused because no one had ever done anything quite like that before. It looks good on paper (why wouldn’t everyone take the train from the suburbs). DART can be excused because they really didn’t want to spend a bunch of money. I don’t know what our excuse is, to be honest. Whether it is bike share or building a subway, we seem to think that we are the first city to every build anything like this. Until that attitude changes, we are destined to keep making stupid mistakes. Poncho, I don’t think any of these things have been here anywhere near long enough to make that judgement. Neither of our two existing streetcar lines has failed, in usual sense of no improvement possible and therefore pave the tracks. South Lake Union needs a reserved lane and a couple of streetcar-only signals by the lake. And there’s nothing to prevent the extension up Westlake at least to Fremont that’s always been in the plans. First Hill’s only been running for what, a year or two? For main operating inefficiencies, fairer to say that Jackson Street needs some more painted pavement, and that since Broadway has long since outlived its usefulness as a through corridor, necessary arrangements to give streetcars priority make more sense than losing the streetcar. By definition, woonerfs that don’t woon-erk (sorry, reflex) easy to move. And the two pedestrian plazas I’ve seen the last couple of days, Bell Street and Occidental Park seem to work just fine. However one combined example of plaza and streetcar definitely need each other in order to work at all after coming re-build. The Waterfront, Pioneer Square, and the top of the north elevator at IDS used to have a streetcar line of 15 years’ success. Enough that it stayed on renovation renderings for several years after the needless decade-long shut-down. Before being quietly pastel-chalk-ed out. Perfect example of two interconnected things whose success depends on the outcome of the political fight necessary to set them right. History’s verdict still equally open on Bike Share, Seattle, and visibly, the United States of America. Any bets on which one is presently a woonerf? I don’t disagree that it has some weaknesses, or that it compares unfavoraably to Skytrain or a DC Metro style solution. But if you compare it to other American light rails, it’s more grade separated, faster, and more frequent. Those are long-term strengths that show America a better way. It’s as unprecedented as BART in its own different way (and it serves much more of the city). We still don’t know the full extent of how much it will be used or considered indespensible because most of it is not built yet, and we don’t know how much it will influence future networks in other cities or in what way. The FTA thinks it and RapidRide are great and a step forward for the US, even if you don’t. Others in other cities probably feel similarly. Not NY, DC, Boston, Philly, Chicago, San Francisco, and Los Angeles that already have more comprehensive transit networks, but the other 85% of the country. That does sound better than a bikeshare. There are still companies that rent bikes like the ones around Greenlake and Zach’s bike delivery service. Sure it doesn’t address the “pick up a bike downtown and ride it three blocks” market, but is that really a priority? Especially when the alternative is cycletracks through downtown that are free for everyone and always there? Get the roads right first, then the bikeshare can follow. Zipcar and Uber have challenged the car-ownership model; maybe more things like that will arise will challenge the bike-ownership model. A bicycle-sharing system … is a service in which bicycles are made available for shared use to individuals on a very short term basis. Bike share schemes allow people to borrow a bike from point “A” and return it at point “B”. In other words, the “ride it three blocks” trip is the point! That is the only reason it works. At my lunch hour I bike ten blocks and have lunch with a friend. To get to Seattle U, I ride a bike from the train station. During a break at my busy job, I bike over to the local grocery store, and grab something for dinner tonight. That is what it is for. It is simply public transportation. As such, while it doesn’t carry huge numbers of people, even in isolation it performs very well for the money. We aren’t talking about billions to serve Fife, here — this is a very tiny amount of money. This is why cities like Chicago (which have real problems) have bike share. But the only way it works is when you have lots and lots of stations. The research shows this (http://nacto.org/wp-content/uploads/2015/09/NACTO_Walkable-Station-Spacing-Is-Key-For-Bike-Share_Sc.pdf) and the problem with our bike share system is that it ignored this. Way too few stations, and way too small a coverage area. Consider my examples: Lunch hour from, say, a job at Real Networks (Safeco Field) to that nice Chinese restaurant everyone has been talking about. Sorry, nothing close to my work, and worse yet, only one stop in the I. D. How about Seattle U.? Yeah, sure, but only if you are going to that one spot in Seattle U. One! (We seem to have a theme going here). How about a trip from Children’s Hospital over to the nearby QFC (in U-Village). Guess what — the only station close to the U-Village is completely on the other side. In all these cases, not only would someone drive instead, but probably drive to work as well. How often have you heard “but I need my car at work today to …”. So while bike share might not get huge numbers of riders, it still helps reduce the number of cars on the road. As to why this failed, it is simply a case where they ignored best practices, and tried to implement a system without adequate coverage or station density. It isn’t the end of the world, of course, but just another failure. Unlike some of the other mistakes, it won’t cost us billions to fix. You’re basically right. For all the comments about helmets, they had nothing to do with Pronto’s failure. It began at exactly the wrong time (look, it’s raining and dark and all the tourists have gone home, let’s launch bike share NOW! ), built way too many stations, covered odd places like Children’s while ignoring obvious places like Fremont, never expanded, never had any events or publicity stunts that resonated with the public, and got on the wrong side of the media almost immediately. I’ve been the fortunate one that I’ve had more success using Pronto than basically anyone. It provides some small links (e.g., from UW Station to 12th and Campus where I pick up the 31 or 32 to go home) that really work for me. I’ve also, at 60, ridden it from the Convention Center to the top of Capitol Hill, which probably means that other people younger and more fit than me might have done so without killing themselves if they ever considered doing it. But the time a reporter stopped me on my ride to interview me about my Pronto experience, his editor clearly didn’t want to publicize the idea that someone actually liked the thing and found it useful because the interview never aired. Where is that edit button? Way too FEW stations. I was a big user of Pronto, too, during the first year. It closed the gap of a mile between the end of the SLU Streetcar and my home. But, when October came around and time to renew, I could not justify renewing just as rainy season was starting. Then, all the doubts began creeping up in the press, and I never rejoined. I could tell which way the wind was blowing. But I got a great t-shirt that says I am a founding member! I’m comparing it to spending the same amount of money on other bike infrastructure in the same city. A good bike share may be very effective and low cost, but is it better than all other bike investments you can do with the same amount of money? Does it serve as large a cross-section of the population? Is it better for visitors than anything else? What makes the Netherlands great is the ubiqudous cycletracks that even grandmothers ride daily. And with comprehensive bike infrastructure, more people would want to own bikes so fewer people would need a bikeshare. And other kinds of bike-rental or bike-pooling systems might appear, lessening the need for a municipal bikeshare. I understand the niche of “I want a bikeshare for one part of my day’s journeys but not for the entire thing”. That may be worth the city investing in. But is it absolutely the top bicycle priority? Or the top non-car transportation priority? Where does it rank? You assume a zero-sum budget for one thing (a mode of transportation) and another (cycling infrastructure), which is simply your assumption. Why shouldn’t this city have both? Why should the cost of cycling infrastructure have to come from this budget when the city has a complete streets ordinance and has broken its promises on providing it for years? We passed a funding measure to pay for this stuff; why is it coming out of bike share? The immediate question is not whether this is the only money we’ll spend on bicycling, but whether this specific Bewegen proposal is better than doing something else for now. I side with those who are concerned that all-electric bikes are a dubious tradeoff for a a larger-area network. Bikeshare won’t reach its potential until it covers both central Seattle and the BGT/45th low-hanging fruit. If the bikeshare proposal were better I’d defend it more. I’ll ask toy the same question I asked RossB: where does a smallish bikeshare rank in terms of priority or project order toward our long-term bicycle future? This is somehing the city and public should clarify too. What priority or level of urgency is a bikeshare? It’s not “coming out” of bike share; the other funded projects are still proceeding as they were. The bikeshare money is funding additional projects. The mayor believes the Bewegen proposal is weak, and that doing other things would be more beneficial than another round of bikeshare proposals at this time. You may think the mayor is wrong, but that’s the proper role for mayors to make decisions and citizens to disagree with them at times. But is it absolutely the top bicycle priority? Or the top non-car transportation priority? Where does it rank? But ranking different transportation (or just plain civic) improvements is very difficult. Should we spend money on sidewalks or bike lanes? More bus service, or better traffic signals? It is always a tough call. But personally I think this is a bad trade-off. As far as bike infrastructure goes, I would say we are doing just fine. Not as well as promised, but the key elements of our system are built, or are being built. We will soon have a pretty decent path all the way around Lake Union, with paths extending north (on Roosevelt) as well as east-west (on the Burke Gilman). There will be (or exist already) ways for someone to get downtown. Bike sharing is just another option, and a very cheap one, really. It doesn’t take that much money to build a good system, which is why it is common for private companies to foot the bill (notice how no private company will pay for a subway). Right now, given our current (and funded) bike system, I would put money into a bike share system. I just don’t think think we will every be a city where everyone bikes everywhere, no matter how much we improve the roads . Despite guys like Breadbaker, most of use won’t bike up huge hills. I won’t bike to Lake City, just because I have to bike up a steep hill on the way back. So despite the city building a very good bike lane on 125th, it really isn’t used that much. Even from Lake City to the U-District is a real pain. Not as bad as going over Maple Leaf, but still a lot of work. So while there are definitely some areas that need improvement, there is only so much they can do. Besides, some of those improvements (such as fixing the Ballard Bridge to make it palatable) are really expensive. On the other hand, that is exactly why bike share has great potential. Within Ballard, riding a bike is great. Phinney Ridge is the same story. It is a real pain to climb the hill from Fremont, but once you are up on the plateau, the world is your oyster. You can safely and easily travel miles and miles (via side roads and bike paths) beyond the city limits. Same with much of the Central Area and of course the lower elevation places (which, as I mentioned, already have or are building great infrastructure). In short, you can move around by bike really well within a lot of areas, but not from one to the other, which makes it particularly promising for bike share. A big reason cited for the City’s $1.4 million purchase of Pronto was the repayment of a federal grant of $1 million if the system was scrapped. Is the City still on the hook for that $1 million payback? Though I hope bikeshare will be back, and serve more of Seattle, when the infrastructure is in place, it’s refreshing to see elected officials being willing to crack a few eggs, so to speak. Some will continue to bemoan defunding the neighborhood councils. That decision was long in coming, given how those orgs have become so out-of-touch with the typical voter (and how historically hateful some of them were toward bike infrastructure, among other questionable prejudices). Will we now see the mayor and council consider at least delaying the 1st Ave Streetcrawler construction until Northgate Station opens? That would seem incredibly wise, even if a small chunk of federal money has to be returned. And the monorail … We own it. We fund its maintenance and capital improvements. (But they are proud to be operationally profitable.) Can we now insist that they must operate as part of the public transit system, with full fare integration, if they want to keep their public funding stream? Then there are those Restricted Parking Zones set up to privatize the public right-of-way into the hands of neighborhood residents. Some bemoan the cost of the permits, but they are far cheaper than bus passes, and have a reeaaaallly cheap low-income version. Yeah, the bus fares pay for only a quarter of the cost of running the transit system, but do those parking permits pay for the cost of keeping up the privatized asphalt covered by them? Even a quarter of the cost? I like this willingness to re-examine and axe programs that are providing little public benefit to the public paying for them. Let’s make sure bikeshare isn’t the only program being so examined. Now, in defense of bikeshare, I believe we imposed new expectations for reduced prices for low-income customers after the contract bidding process. That may be a unique feature, albeit one that wasn’t effective in drawing low-income customers. I hope we look at effective practices that remove financial barriers to use before the next time we open up a bidding process. How much did Alaska Airlines kick in to get its name on these bikes? $2.5 million in 2014* — probably not their best return on the promotion-budget dollar. Long overdue action on the part of the mayor. Forget the politics, bikeshare was simply failing and had no reasonable chance of success. This money could be much better spent elsewhere. Good riddance bikeshate. Spend the money on something that will actually work and make a difference. How does failing to build a simple bike share system — that many, many cities have done — show that we know what we are doing? That is crazy. Fred can’t fix a car, but did you see how he tried to build that dresser from IKEA? Yeah, he failed completely — ended up smashing the thing. The guy is certainly getting smarter. No, this is a failure, and unlike most of the other failures, wouldn’t have taken that much money to fix. All it would take is simply adding more stations. Holy smoke, if there is any project in this town that should be abandoned, it is the streetcar. But instead we are doubling down on that nonsense. I guess that source of ridicule will still be around a while. Oh, and if there is any solace in this news, it is that we at least have precedence here: Please mayor, kill the streetcar and put the money into bus service! You’ve done it before. Did the streetcar ever get on onebusaway? Poor real time arrival and unreliable travel made it pretty difficult for me to use. By your logic, Lazarus, the only thing wrong with Pronto was that they set the targets too high. Both systems — the streetcars and Pronto — carry very few people. But that isn’t the point. Bike share systems do what no other system can. A properly built bike share system is popular in cities with the best transit systems in the world. They work for short trips, when it just doesn’t make sense to bother with other forms of public transit. On other hand, there is nothing the streetcar can do that a bus can’t do, for a lot less money. Our streetcars (because they are no bigger than our buses) offer no significant advantage over our buses. Meanwhile, there are huge disadvantages to the streetcars, from an implementation and operational standpoint. Cost, safety, flexibility all suffer for no reason. Do you really think that a bus route operating on the exact path as the streetcar would have significantly lower ridership? Keep in mind the streetcars are some of the lowest performing routes, despite operating completely within the urban core. The idea that the cosmetic advantage of the streetcars will automatically lead to high ridership has been proven false in this city. Spending more on these things is just putting good money after bad. All the tea leaves were definitely pointing in the direction of abandoning bike share altogether, as it’s all too easy to forget about the problems with how Pronto was implemented, and assume that Pronto+failure means bikeshare is inherently incompatible with Seattle. In fact, the only surprise is that the announcement came so quickly. I was expecting the contract with Bewegen to get delayed a year due to technical issues, then quietly killed the following year, rather than publicly killed now. That said, while I am disappointed that bikeshare in Seattle is now effectively dead for the foreseeable future, there is also the reality that the downtown bike network really does need substantial improvements, and any new money to help them happen is always a good thing. Even for those that don’t ride bikes, more protected bike lanes is a good thing because it narrows the street (which reduces speeding) and increases the buffer space between the cars and the sidewalk. Of course, even if publicly-funded bike share is now a permanent non-starter (at least for the next generation), it’s not completely out of the question that a privately funded system could someday materialize. Even if it seems far-fetched now, Car2Go would have seemed far-fetched ten years ago. In some ways, a privately funded system might be able to do better, without government bureaucracy interfering with the design. For example, one could imagine a system with a home area that basically follows the flat bike routes around Lake Union (Burke-Gilman/Westlake), and the not-yet-built protected bike paths between Lake Union and downtown. Imagine such a system where you could pick up or drop off a bike anywhere along the corridor. Imagine if it had the Car2Go pricing model, but cheaper (e.g. $0.10/minute, with a cap of $30/month for very frequent users). To start a trip, just tap your NFC-enabled smartphone on the reader mounted on the bike, and tap again to lock the bike at the end of the trip. (Ideally, there would be no registration process, just tap and go, but the lawyers would probably not allow that). And, no getting bogged down in the “social justice” issues of accessibility of people without credit cars, or attempts to serve hilly areas. Not serving hilly areas? That leaves out downtown, First Hill, Capitol Hill, Fremont, … um, what’s left? Many hilly areas still have flat bike routes between them. In the cast of Fremont, I would focus on the parts at the bottom-of-hill, by the Burke-Gilman trail and the Fremont market, and not serve the other parts of Fremont near the top of the hill. Another approach — call this crazy — is to base your system on all the available research, and build it accordingly. That means lots of stations everywhere (with more bikes in the more popular stations). Just being constrained by stations is, in and of itself, a hindrance. Even just going a couple blocks out of one’s way to reach a station can several minutes to the trip, to the point where you may as well not bother with bikeshare at all and just walk the entire trip. It also means that when the docks are full, no one else can park there without expensive rebalancing. In fact, in a world without the constraints of stations, I would argue that any re balancing of bikes within the home area might be more trouble than it’s worth. Yes, the system would be less reliable without rebalancing, but bikeshare doesn’t need to be a system that you can absolutely depend on, since we’re talking about areas with lots of other transportation options around – just something cheap enough and easy enough to use spontaneously when you see a bike lying around. Avoiding rebalancing, of course, goes hand in hand with restricting the home area to flat sections of the city – it avoids the need to constantly truck the bikes up the hill after people ride them down. While I think Pronto had some other issues (pricing, station locations), by far the biggest barrier to growing bicycling in Seattle is safety- most people just are not going to start bicycling if they are afraid of getting hit by cars. Yes! That is exactly why I don’t bike. It’s plenty safe in residential areas and pretty safe on non high-volume arterials. I never had any problems on Eastlake, Aurora north of 73rd, Stewart Street, etc. The only places that scared me were 4th Avenue downtown (the cars so thick), the Aurora bridge (the sidewalk so narrow), and Westlake (the cars so fast right next to you). There are biker’s-paradise tricks all around, like the Melrose-Lakeview-Belmont corridor between First Hill and the U-District, or places where you can compress all the elevation into one or two blocks and ride flat the re4st of the way. Now there are designated greenways, like east-west across Ballard and north-south across Beacon Hill, and the I-90 trail from the Eastside to SODO. Just trust that the cars will go around you, be as visible as you can (bright jacket, lights), and avoid streets and times where traffic is thick but not yet slow. For instance, Aurora and 15th Ave NW fill up peak hours, but off-peak there’s lots of space and cars will give you a wide berth. I agree, Mike. There are huge parts of the city where I feel comfortable biking. The problem is that there are also connecting points (bottlenecks if you will) that are very scary. Unfortunately, fixing those problems is really expensive. For example, making the Ballard Bridge safe for biking will cost a lot of money. More money than a decent bike share system would cost. This is why this decision bothers me. This is done in the name of bike safety, but what really, will this buy? A few extra sharrows? Great. On the other hand, I simply avoid biking over the Ballard bridge on a bike. If I want to get from Interbay to the west side of Fremont, I’ll just hop on the (frequent) D, then ride the Burke Gilman over there. At least I would, if we had a bike share system. We don’t, so I guess that means waiting for the 40 so I can take it a half mile. In my fantasy world, the Pronto street spaces can now be designated for electric scooters and motorcycles that people own and maintain themselves. The parking rates could be 1/4 of cars. Shops could rent electric scooters too. It always seemed excessive to maintain a complex system for occasional use, when we could have a less complex system for regular use. Do you have data that this “regular use” would equal even Pronto’s usage? If you’ve been to Paris (similar climate), you see how scooters are everywhere. If you’ve been to San Francisco’s downtown, you see blocks of parking full of scooters and motorcycles and no spaces vacant. You do realize that if implemented correctly, a bike share system involves each bike being used an average of five times a day, every day. I wouldn’t call that occasional. More to the point, do you really think that an average privately owned and operated bike or scooter sees that many uses during an average day? Not even close. Occasional use is from the perspective of the user. If a user owns and maintains their own vehicle, then they could use it 4 or 5 times a day. With the Pronto model, the model is more that a user would only use it once or twice a day. My bigger point is that we do nothing as a city to encourage electric scooter and electric bicycle ownership, but have been instead considering spending millions to set up an electric-bicycle sharing system. These transportation vehicles do not take up the road space or parking space that cars do, and do not require a huge up-front cost that cars do. There isn’t nearly the economic justification for a short-term shared electric bicycle rental system like there is for cars. Finally, merchants could easily rent electric bicycles from inside stores so that people can take their purchases home then quickly return them to the store much easier than having this wild network of small unmanned stations with wet-seated electric bicycles that require a whole system to maintain. Seattle generally treats scooters and motorcycles like cars and it’s totally unfair. Parking rates are what cars are, and spaces seem to only be provided when there isn’t enough room for a car space. Why is an electric-bicycle of 50 CCs good but an electric scooter of 250 CCs bad? Thank goodness. Seattle is a terrible city to bike in. Crazy drivers, lots of hills, rainy most of the time. If you want to bike, just buy your own bike and risk it? Seattle’s got a lot more going for it in terms of biking than most cities with successful bike share. Chicago was a terrible city to bike in when I lived there. Their bike share system is now a huge success because it’s big and has docks every few blocks. I imagine many people ride the train in and then use the bike share for short trips around the neighborhood. Granted they have also installed a lot of protected bike lanes as well. NYC and DC also have very successful large systems. The Bay Area is expanding from 70 stations to 700 (more stations than we have bikes). Plenty of cities with snowy winters and incredible rainstorms also do well with bike share. >> I imagine many people ride the train in and then use the bike share for short trips around the neighborhood. Yes, that is exactly what is it for. If that short trip happens to be up a steep hill, they probably don’t ride the bike. But there are plenty of short trips in Seattle where bike share could work well, if we implemented a system correctly (with lots of stations). A bicycle-sharing system is a service in which bicycles are made available for shared use to individuals on a very short term basis. Bike share schemes allow people to borrow a bike from point “A” and return it at point “B”. Point A to Point B? My brain hurts. What does that even mean? Does that mean that, like, you can take a bus in the morning to work, then ride a bike a half mile to, you know, visit your friend for lunch? Yes, yes it does. It is why over 600 cities have implemented similar systems, including many cities with hills. I found the station placement absolutely incomprehensible. I hear from everyone that there weren’t enough stations downtown to achieve adequate station density. But here’s another problem: there were no stations along bike trails and other places where it feels safe and easy to bike, i.e. along the Burke Gilman Trail from UW to lower Fremont. They would have been physically perhaps too far apart for the bikeshare ideal, but psychologically near — you know there’s nothing in your way except flat exclusive bike trail, and the next station is easy to find. Meanwhile, there were stations at Bellevue and Pine, a location served by four bus lines where the biking isn’t particularly pleasant. When am I going to ride this: the odd Sunday when I don’t want to wait nine minutes for a bus downtown? The initial station locations were where the sponsors were. Children’s was a sponsor so it got a station, and imagined that people would ride it from the U-District to Children’s, and maybe some people do. But you can’t ride it between central and north Seattle within the 30-minute minimum-price limit, except perhaps from the closest station pair, so it’s not getting the longer-distance trips that you think some people might want; e.g., Capitol Hill to Children’s, or Capitol Hill to the U-District before Link or from points away from Link stations. The Bellevue & Pine station was added later, or maybe it was delayed to replace the bus stop that was there. I live right near it but I’ve never used Pronto. It’s in the back of my mind but I’ve never been sufficiently motivated. I imagine everybody rides it down the hill to downtown but few people ride it up the hill. The 43rd & University Way station was also added later, and that’s a practical station. Right where people shop, catch a bus, or in the future catch a train. The Burke-Gilman Trail is low-hanging fruit, either Ballard to UW or Ballard all the way to Sand Point or Matthews Beach or Kenmore. We’ve imagined a bikeshare that started in that corridor and later spread to downtown. But neither Pronto nor the second plan covered much of the Burke-Gilman. Is anybody is looking for a business opportunity as a private operator, here’s one. We can argue all day in the comments about why *Pronto* was not successful. But SDOT already was planning on moving ahead with Seattle bikeshare 2.0, which council allocated money for. If done correctly, meaning a more dense service area that didn’t include far-flung areas like the U District, stations close together, next to transit, with a one-time-use fee, then the $3 million investment would have paid for itself through sponsorship, revenue, and also funded its own expansion, as other systems are doing now. Instead this money will go toward capital projects. Particularly galling is the fact that the downtown network was already in a bike master plan implementation plan two years ago but got yanked out for political reasons. And now, during an election year, the mayor has neutralized this issue with Cascade Bike Club cheering him on to do so. Exactly. This is why this pisses me off. They had the opportunity to do this correctly, and now it is cancelled. 3 million dollars is a relatively small amount of money, and won’t do much of anything to improve bike infrastructure. Just fixing the Ballard Bridge — nothing more — would cost around 20 to 40 million dollars (http://www.seattlebikeblog.com/2014/09/29/study-widening-ballard-bridge-sidewalks-possible-but-it-wont-be-cheap-is-there-an-easier-way/). Just moving the streetcar a couple blocks (for the Roosevelt bus improvement project) will cost 7 million. This is a real blown opportunity. the city never really put in the effort to make bike share work. when the request for proposal went out for what should have been pronto expansion, someone at SDOT slipped language in there that preference would be given to a company that could provide an ebike solution. instead of expanding the current system the new system would replace it with ebikes and be only marginally bigger. imagine if the whole 5 million were used to expand, it could have probably tripled the size of the system. I’m not sorry that the bewegan plan is getting cut, it was doomed for failure. Also it seems as if a lot of this money is actually going to pedestrian projects not bike infrastructure. Most of the money is earmarked for Safe Routes to Schools, which mostly benefit both and focus on traffic calming and crossing assistance at major arterials. As long as SDOT thinks of bikes as slow cars and not as fast pedestrians, only a few percent of people will risk biking. Good urban bike infrastructure is either a really narrow street (which sadly don’t exist in Seattle at all) or basically an extra sidewalk for bikes. I have no confidence that promised downtown improvements will help at all. In the Netherlands the bike share (OV-fiets) is integrated with the national bus/rail pass. You can get bikes right at station. If Seattle ever gets its infrastructure together and bikeshare returns, you should get transit/bike transfers with your ORCA. Ideally TOD should include bike infrastructure too. It would help with the wide station spacing a lot. Anecdotally, in my opinion Seattle is becoming a much scarier place to cycle. There are so many more cars on the road and way more aggressive douche bag drivers. Every time I bike through SLU I fear for my life (giant SUVs speeding around everywhere), and the Broadway cycle track (which I ride daily) barely protects you from right hooks and drunks. It almost makes me miss just riding unprotected like a maniac in traffic. Great news to improve safety infrastructure and I’m glad that they aren’t going to throw more cash at the dog that is Pronto. Now we need the Link cattle car for all the bikes. Yes. I did a lot of biking in South Lake Union in 2007, for specific reasons, and I did not fear for my bodily safety as much as I do nowadays. How about relaunching it only along the Burke Gilman and destinations very easy to access from the BGT? poncho: you could form an entity and buy Pronto from SDOT; you could partner with parks, UW, and Children’s; the BGT Pronto would be along the BGT from Golden Gardens to Matthews Beach via the Locks, Ballard, Fremont, Garworks, UW, Link, U Village, Childrens, and Magnuson. go for it.